This delicate stacker can be worn by itself, complimenting another ring, or as a pendent on a chain. 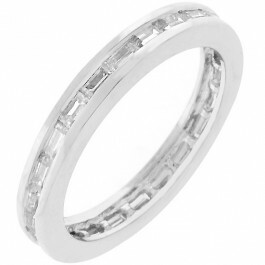 Bright White Stacker features radiant clear CZ baguettes set in silver tone that will POP under any light. Stack 'em up! White Gold Rhodium Bond is achieved using an electroplating process that coats the item with heavy layers of rhodium, a close cousin of platinum that costs three times as much, which gives our jewelry a platinum luster.